Description of "Defenders of Kron - The Lurgs of Kora"
Aaron Ridwik is now a Defender in training. He had proven himself worthy with his wits and courage. But this is just the beginning. Now, he must take a journey back to The Blue Mountains where the Lurgs of Kora are searching for something precious. And what he finds there will change his life forever. Ritu Ghosh is the author of The Defenders of Kron Series. Ritu traveled quite a bit as a child as her parents moved to new towns every few years for their work. An adventurer at heart, Ritu grew up being a story teller to her kid brother and friends who followed her around to listen to her stories, which were usually entrenched in Mystery, Magic and great Adventures. 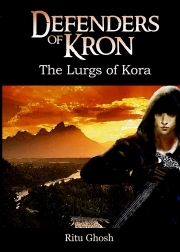 Reviews of "Defenders of Kron - The Lurgs of Kora"